"I had rather be shut up in a very modest cottage, with my books, my family, and a few old friends, dining on simple bacon, and letting the world roll on as it liked, than to occupy the most splendid post which any human power can give." 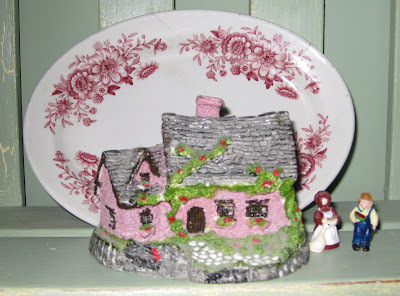 This little pink cottage, a gift from my dear mother, has always held a special place in my heart. Simply quaint and romantically cozy - this is the dwelling I would be content to reside in. Standing behind my cottage is a "Dayton" oval plate made in Grafton, West Virginia, a gift from an aunt. 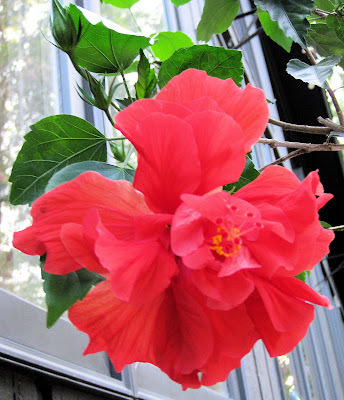 I just had to share my most gorgeous Hibiscus flower - one of many blooming on a small tree on our back deck. Scrub the potatoes, slice them, and put in a pot with water to cover. Boil the potatoes until tender, then drain and mash them with 2 tablespoons of the butter. Add the cottage cheese, onion, and salt and pepper to taste. Stir the mixture gently, and then put in a greased casserole. Dot with the remaining 2 tablespoons of butter and sprinkle with paprika. Bake, uncovered, for 30 minutes. See what the OTHER Pink Saturday bloggers are sharing with us today. I like the hanging plate. It's beautiful and the saying is wonderful!! Love your post, especially this PINK plate! *Can't wait for Dancing with the Stars to start!!! Love the little cottage. Such a lovely keepsake. Have a Happy Pink Saturday and a Wonderful Labor Day Holiday! What a beautiful post! Thanks for sharing...Happy Pink Saturday! The recipe sounds very good! I'll be adding this to my "to make" list. i too love the cottage of contentment plate! Your garden must be beautiful with flowers like that. Lovely post, Deborah! Happy Pink Saturday, sweet Deborah. May we all be blessed to have a content cottage. Thank you for sharing these special things with us. I came to your blog recently to use the recipe you had a while back for the pink pie (I don't remember the name.) But, I can't find it. Did purchased the ingredients, but I need the recipe. I'm a Dancing with the Stars fan too! I love the TJ quote. It is so true! Thanks for visiting and your name is in the pot for the give-away! Love your cottage! Happy Pink saturday. All your pinks this week are beautiful. I especially like your mother's plate. Have a great holiday weekend. Happy Pink Saturday belated! Love the charms too! Sounds like a tasty recipe!!! What a darling PInk Cottage saying! I love the quote on the plate. Have a great pink day. Your *pink* cottage is adorable. 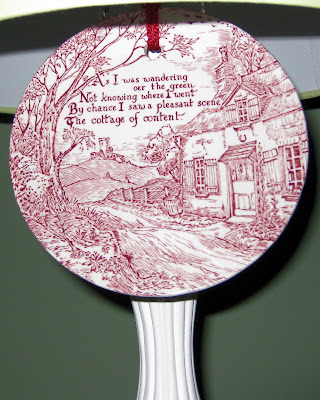 I really like the beautiful *pink* plate that is hanging, it has such a nice saying on it! Your *pink* flower is so lovely! Mmmmm.... I love potatoes in any shape or form and I will definitely try this recipe. Great pink pics, my favorite being the hibiscus. Their blooms are just ravishing!